Early in the evening, on a late November night, the Big Dipper skims the northern horizon. Turning our attention east-northeast, we first come to Capella, the brightest star in the constellation Auriga, the Charioteer, and the sixth brightest star in the sky. Unlike most proper star names, Capella is Latin, and means the little she-goat. Capella is a multi-star system about 42 light years distant. Looking due east almost thirty degrees from Capella, or the width of three fists held at arm’s length, we come to the star Aldebaran, superimposed on the much more distant Hyades open star cluster. The Hyades represents the head of Taurus, the Bull, and Aldebaran, Taurus’ eye. Aldebaran, the brightest star in Taurus, is a double, or binary, star system consisting of an orange giant and a faint red dwarf companion. Aldebaran in Arabic means “follower,” so named because it rises after the Pleiades and follows them across the sky. The Hyades have a distinctive V shape with five members visible to the naked eye. It consists of approximately 300 to 400 stars about 152 light years from Earth. Its large size is indicative of older open clusters in which the stars have scattered over time. Continuing onward in the same general direction, we come to one of the most magnificent open clusters in the entire sky, the Pleiades. 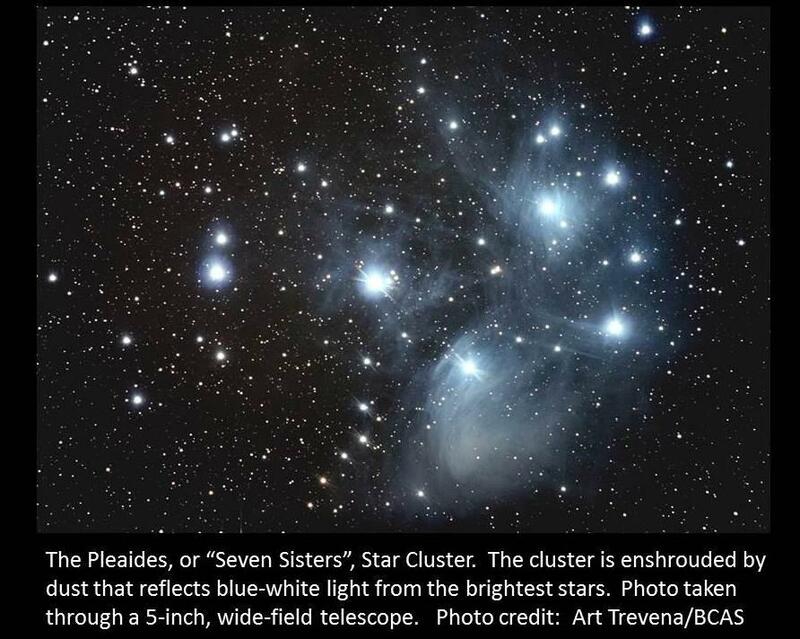 Known since antiquity, the Pleiades, also known as the Seven Sisters, is a relatively close, young cluster. At least six or seven members are easily visible with the naked eye and, under ideal conditions, eleven or more stars are visible. How many can you see? In a pair of binoculars the Pleiades is a truly magnificent object with more than a hundred stars visible, out of a total of approximately 1000. Viewed through a telescope under ideal conditions, and in photographs, several of the Pleiades appear to be enveloped in nebulous material which reflects the light of the stars. However, the gas and dust is not the remnant of the cloud out of which the Pleiades formed. Rather, the Pleiades are merely passing through it. Western Slope Skies is produced by members of the Black Canyon Astronomical Society. This episode was written and recorded by Bernie Forman.